As a technology company, PlastiComp focuses on bringing your product vision to life. We apply the technology and performance benefits of long fiber reinforced thermoplastic composites to make your products better – giving you an unbeatable marketplace advantage to grow your business and realize greater profits. Seldom do you have the time or expertise to perform every task your business demands, which is why successful product development is a collaborative process that requires a partner with innovative technology, material and processing experience, along with design to production resources. Like PlastiComp itself, our partnerships are built upon respect, integrity, and trust. With every relationship, we ensure the utmost exclusivity and confidentiality of all information, technologies, materials, and processes. 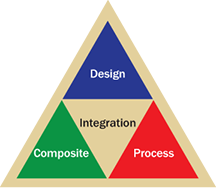 Whether it is a shorter-term partnership to provide a composite material solution that works, or a longer-term partnership that start with a simple idea, which together, we build into a product that outperforms your competitors – PlastiComp is the partner you need for structural thermoplastic composite solutions. When needed, PlastiComp can be more than just a source for composite pellets. From in-house product design and performance analysis capabilities all the way to component forming using injection molding or extrusion methods, we can simplify your product development process by providing a single-vendor solution. From complimentary evaluation samples to accessible experts ready to answer your questions, we strive to provide unmatched quality, service, and support others have forgotten is important to building and maintaining strong partnerships. Foremost, we know our success is dependent on ensuring you succeed. Our long fiber composites excel at being stronger, tougher, and lighter. We tailor the structural properties of our composite products to meet your performance specifications and are renowned for our metal-to-plastic conversion and multi-functional material expertise. Successfully using composites goes beyond simply swapping one material for another. Our product development engineers use an integrated approach taking into account component and tooling design, composite material performance, as well as manufacturing process to maximize material change benefits and quicken your time to market. Injection molding composites provide a wealth of design freedom advantages which we tap to re-envision your products. They easily facilitate complex geometries with intricate details, consolidation of parts to eliminate secondary joining and assembly operations, and improved functionality to differentiate your products from competitors and enable you to capture market share. Innovation isn’t only with materials – it also includes processes used to form them into finished goods. Long fiber composites use a single-step forming process to produce 3-D net shapes with minimal finishing operations resulting in lower manufacturing complexity and costs. Lighter weight composite materials have more cubic volume, which makes cost per pound/kilogram comparisons inaccurate. PlastiComp’s team during an Employee Appreciation Day cruise on the Mississippi River. Long Fiber Composites – High Performance Materials & Designs.